If you're working with a small table of data, oftentimes it just takes a couple of quick sorts to clean it up and make it readable for your users. But for larger spreadsheets — those with tens, hundreds, or thousands of rows — a little more firepower is often necessary when you're looking for specific data points. For this, we use an Excel feature called filters. Filters are automated features built into Excel that will allow us to view a subset of our data based on criteria that we specify. This will make it much easier to isolate rows in a table without scrolling through huge amounts of data. Take a look at the spreadsheet below, which shows SnackWorld's sales numbers by customer and month. 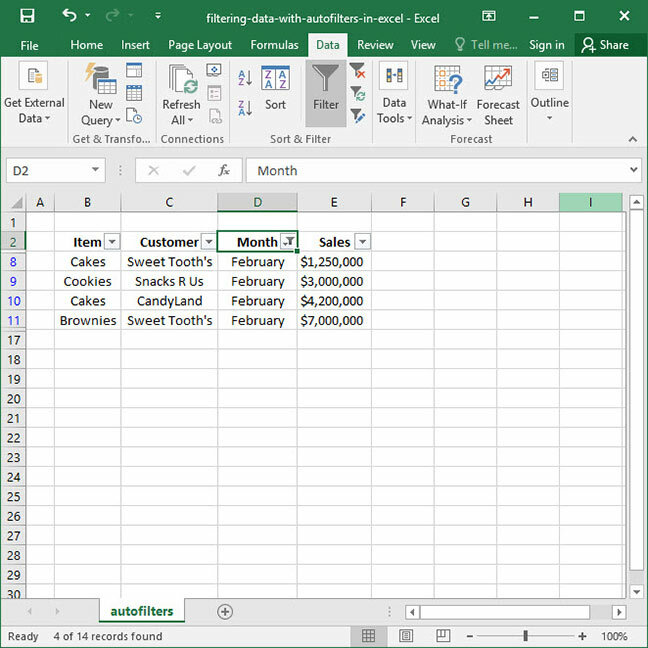 What would we do if we wanted to isolate a particular portion of this spreadsheet — for example, only show rows for which the Month is equal to February? 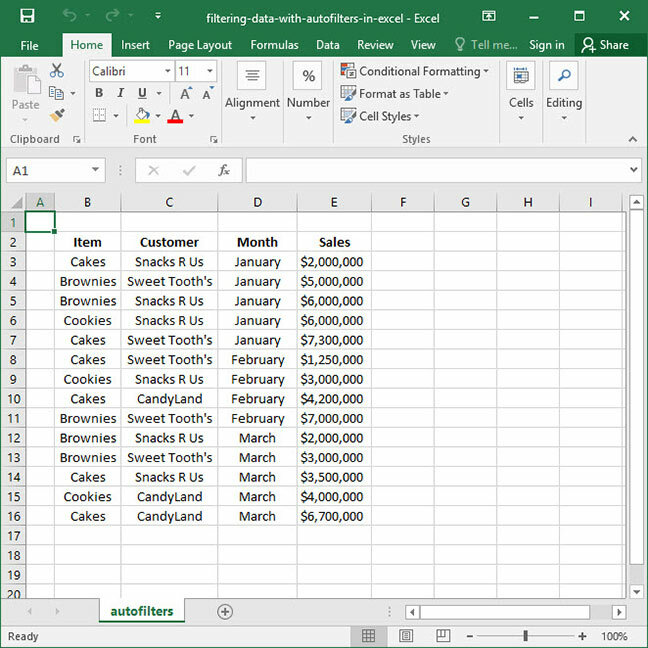 One solution would be to sort our data using Excel's automated sorting features (for more information, check out our guide to sorting and alphabetization). But larger data sets will be difficult to comb through even after sorting. When you see these arrows, you'll know that you're now able to play around with filtering. 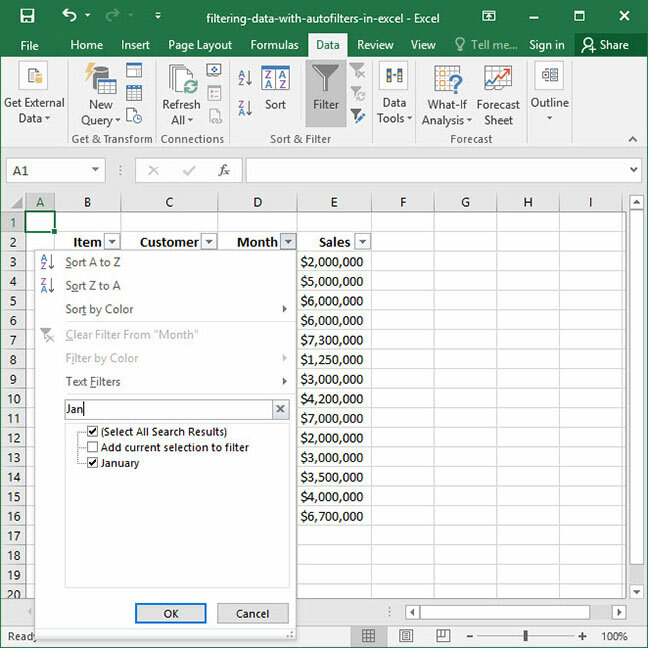 When you filter lists in Excel, it's very important to ensure that the data set with which you're working doesn't have any blank rows. If it does, only the portion of your data above the blank row(s) will be filtered; this can lead to confusion on your part. Remember: check your data first and make sure you're working with a complete, contiguous table with no blank rows! Let's go ahead and press the arrow button next to the Month column header. 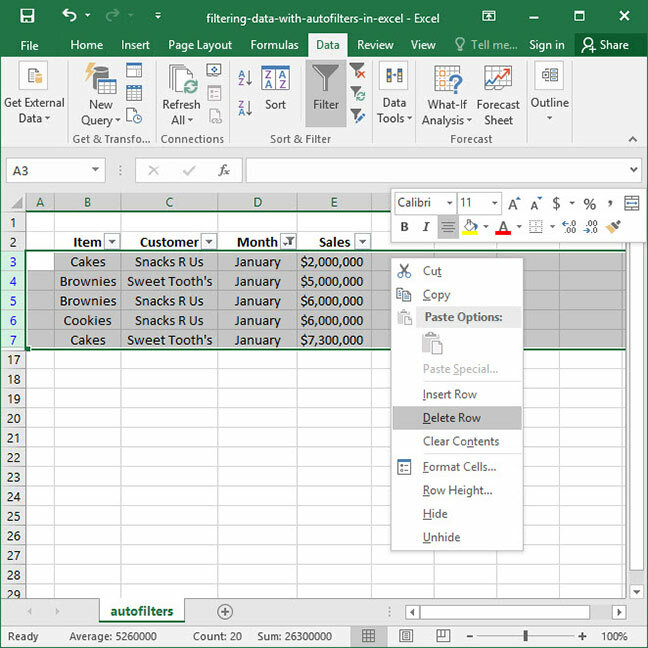 A filtering menu will appear that allows us to filter our data based on any number of criteria we select. Let's review the key features of the filtering menu. First, you'll notice that there are Sort A to Z and Sort Z to A shortcuts at the top of the menu. These allow us a quick and easy way to sort our data without accessing the Data section of the ribbon. Finally, we'll press the OK button to commit our changes. Notice that our table has changed: only rows for which the month is equal to February are now showing! The beauty of this tool is that our actual table has not changed at all. 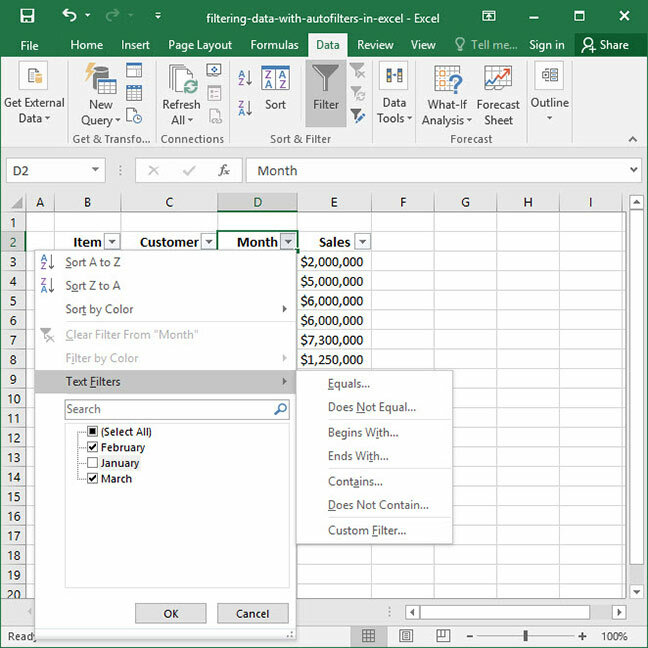 All of the data for January and March is preserved; it's just been hidden by Excel so that we can read our data set more easily. So we've filtered our data and done what we need with it; but afterwards, how do we get our full dataset back? 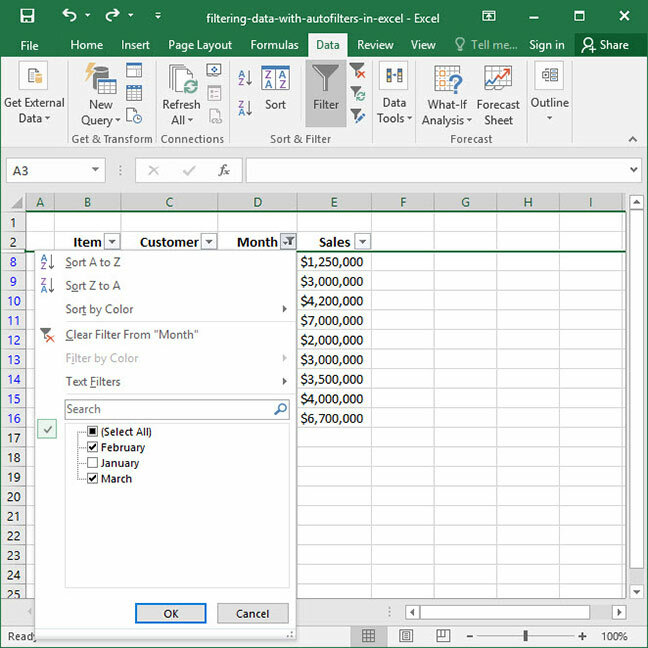 The answer is simple: Excel's Clear filter option. Our filters are working great when we only have three months to select between. But what if our table were so big that it was difficult to find values to select? At this point, checking the box next to January and pressing OK will clear all other filters, so that just January values show in our table. Or, check the box next to the Add current selection to filter option, and January will be added to the list of boxes that are already checked. 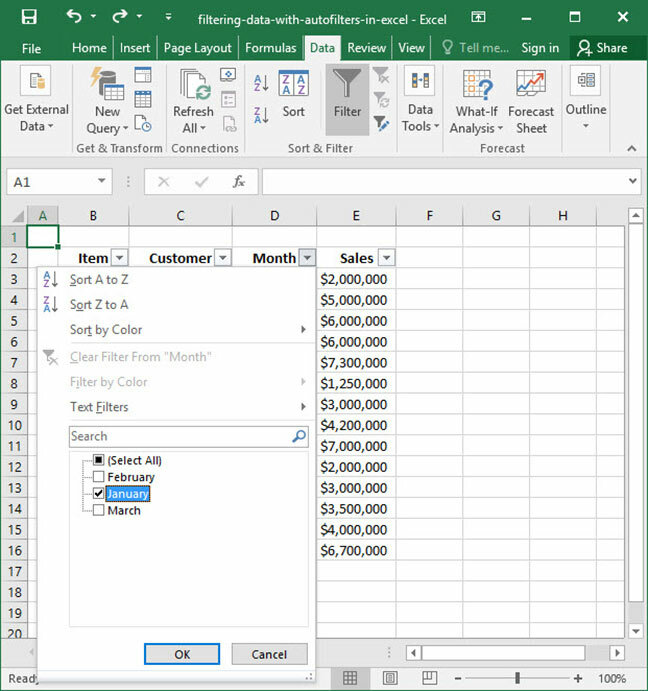 Above, we looked at how to apply a basic filter to one column. 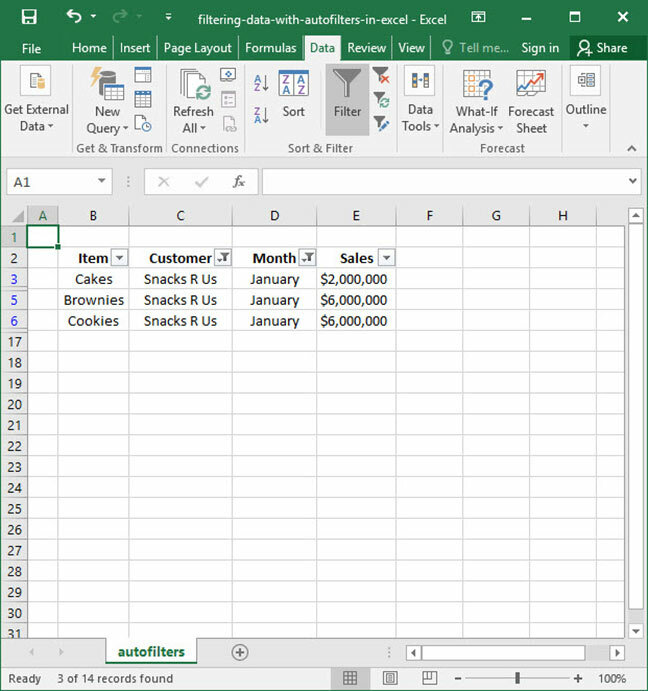 But it's also possible to apply multiple filters — to multiple columns — at once in Excel. Find out how below. Finally, press OK. Like magic, our list is filtered even more — we now see only January sales to Snacks R Us! Numerical columns use advanced number filters, which allow you to filter based on 'equal' and 'does not equal' criteria; 'greater than', 'less than', and 'between' criteria; 'above average' and 'below average' criteria, and 'Top 10' value lists. 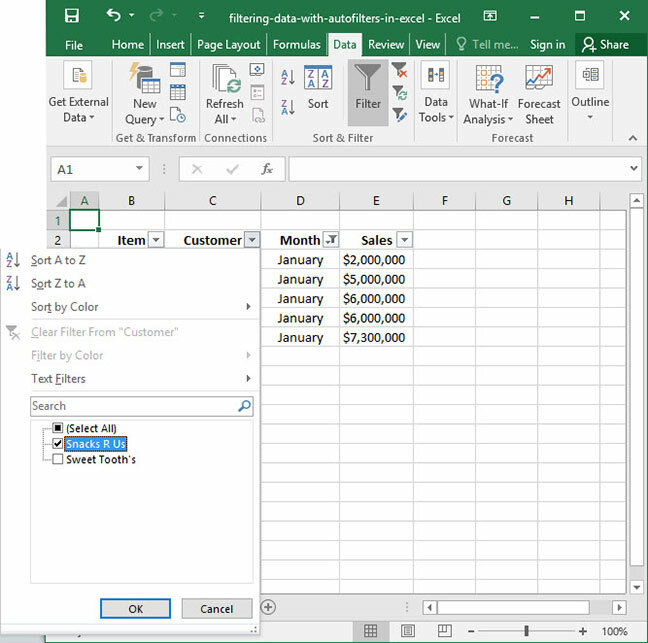 Text columns use advanced text filters, which allow you to filter based on 'equal' and 'does not equal' criteria; 'begins with' and 'ends with' criteria; and 'contains' and 'does not contain' criteria. 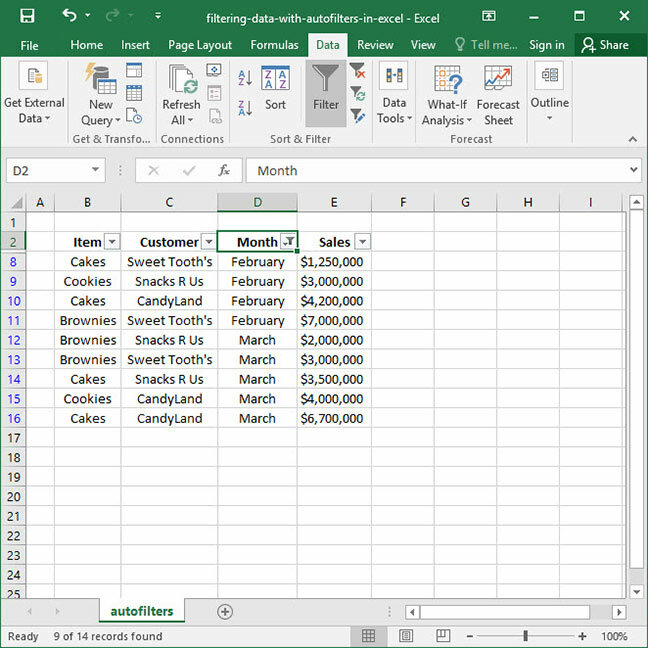 Date columns use advanced date filters, which allow you to filter based on 'before', 'after', and 'between' criteria; daily, weekly, monthly, quarterly, and yearly comparisons; 'year to date' criteria; and other individual time periods. 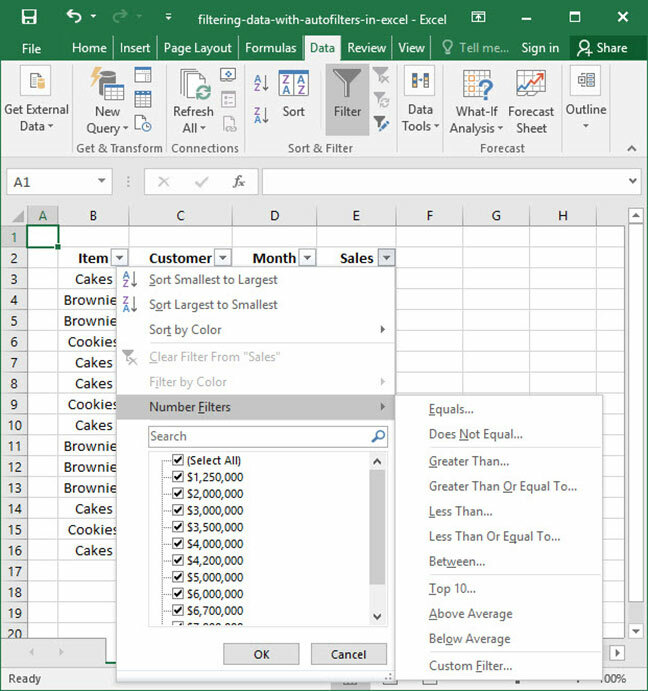 Those are the basics of using autofilters — including filters on multiple columns — in Excel! Questions or comments on the process? Be sure to let us know in the Comments section below.